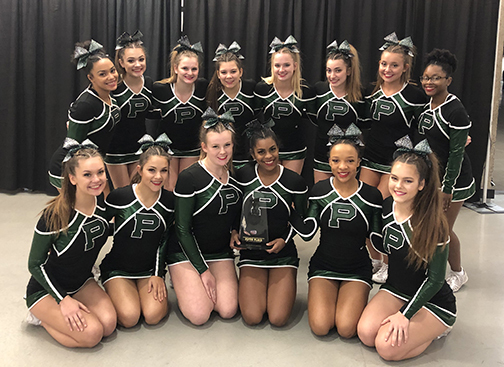 The Pattonville High School varsity cheerleaders earned fifth place at the National Cheerleading Association (NCA) national competition in January. This was the team's first trip to nationals. Team members are: Alliah Allen, Maddie Ambrosecchia, Lexi Blount, Makayla Harden, Quincie Howard, Kesley Kobielusz, McKenzie Massey, Nicole McDaniel, Tori Miniex, Skylar Monnig, Hannah Rodgers, Sofia Serra, Peyton Smith, Amaya Washington and Kathryn Wentz. The cheerleaders are coached by Kalli Hunt, Freddy Shatto, Amy Tran and Audrey Masek.